Mumbai witnessed massive rains yesterday. The city was submerged almost instantly. Rains lashed the city for a few hours continuously and water levels started to rise. This led to massive water logging all over and also huge jams across the city. For some people, the water logging and the jam wasn’t the only problem, as you can see here in the video below. 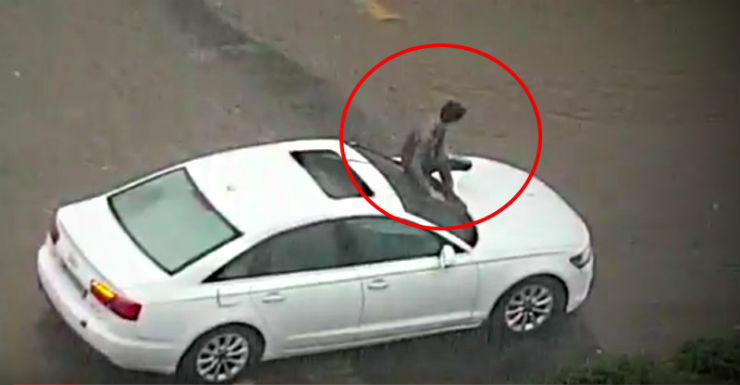 At initial glance, it looks like the driver of the Audi has someone sitting on the bonnet to show him the way ahead, to make sure the car doesn’t get stuck in water. But on closer inspection, you can see that for some reason, the wipers on this very Audi A6 are not working and that the person sitting on the bonnet is actually wiping the windscreen as a substitute to the wiper. As we know, India works on ‘Jugaad’. If there is an easy solution to be found, we make sure to find it and this can be seen here. While there is no clarity on what exactly happened, it could be a wiper fuse which blew or could be the driver drove through excess water and caused water entry into the system. Driving a car through water is a risky affair, especially the modern ones. With a lot of electronics on board, protection against water is key. So what should you do if there is water on the road? Water level is important to check. If the water level is high, avoid going into it. Try to take a u-turn or park on the side till the water level goes down. There is no point in driving into an area with high water levels assuming your car will make it. That is an expensive risk to take. If the car does get stuck in water, then there is not much you can do. You’ll end up with a massive repair bill. There is no harm in stopping if you feel the water level is too high. If you are aware that it is going to rain heavily, avoid taking your car out. It is better to be inconvenienced for some time than to have your vehicle sitting in the garage with a huge repair bill.